Vote for Memorable Days at the Blogger Contest ♥ | Memorable Days : Beauty Blog - Korean Beauty, European, American Product Reviews. Urban Stiletto is holding a Blogger Contest and I'm joining it ^^. Vote for your favorite blogger from The Netherlands ^o^! I hope you girls/guys can help me to vote for my blog on their website. You can vote for it every day and it's actually the first time that I'm joining such a contest =p. ♥ Most Popular title: The blog with the most votes will get the title 'Most Popular'. You will also get the chance to win 6 items from their webshop (which you can use for giveaways) and you will be featured as a style advisor on their website! It would be AWESOMEEE ^__^ to be a style advisor w00t! ♥ Rising star title: The winner of this price will be chosen by the Urban Stiletto team and you can win two goodiebags which is worth €100.-. This title is for a blogger which just started. ♥ Jury's favorite title: Also this title will be chosen by the team. This price is similar to the most popular price. You can win 6 items of their webshop and get the chance to write your own newsletter. I'm only joining for fun and a voice in my head says that there is maybe a small small chance that I will win haha, but I will see how it goes and you never know right=p? However I do need your vote girls, it will only take a few seconds ^____^! How to vote for Memorable Days? 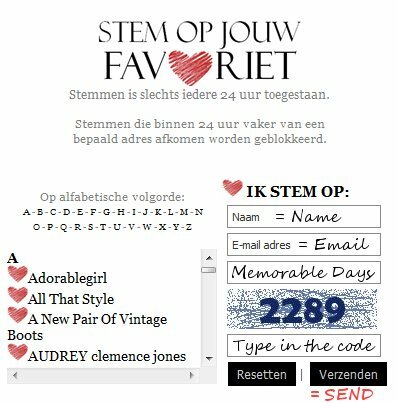 Go to this link: http://www.urban-stiletto.com/blogger-contest-2011/stemmen and you will see the picture below. Fill in your name, email and the name of my blog: Memorable Days and type in the number that you see. When you're done click on verzenden which means send and you're done. (Clicking the blog name in the list isn't possible.) Anyways, you don't need to do anything else. Besides you won't get spam or whatever from this website so don't worry hihi ^__^! People who vote will get a free cookie yay! @Prisje, thank you sweetie ^-^♥! Dank je wel sam =D!! Hehe I'm voting as I am typing this! Krijg ik nu een koekje *Q*? @Michelle, thank you sweetie =D ! @Yak man, thank youuu =D !! @man teng, dank je wel =D !!! @hihihi! thank you ^^! yes dutch is the native language and most of the people can speak english as well since everybody learns it at kindergarten =) wow french in canada =o? I've learned french before, but can't speak it anymore >.< too hard !! Je bericht is succesvol verstuurd. Bedankt voor het stemmen! Over 24 uur mag je weer opnieuw je stem uitbrengen. Tot dan! that means my vote is successful right? voted! ^^ good luck to you! @petitechouxx, yayyy thank youuu <3 !